LYCON's ground breaking stripless hot waxes, shrink-wrap and remove hair as short as 1mm! Perfect for short, stubborn hair on any part of the face and body. Natural and soothing ingredients nurture the skin, leaving it feeling soft, smooth and completely hair-free. Used at an extra low temperature. Excellent on the most sensitive skins anywhere. Vibrant pink, super creamy and flexible with a strawberry scent that smells good enough to eat! 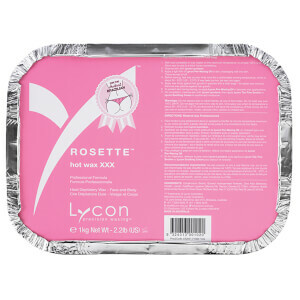 Contains LYCON's unique Titanium Dioxide technology and is extra gentle for sensitive areas. Perfect for Brazilian waxing!